ICV added additional KiPro recorders to our video rental inventory. Need to rent a KiPro? Kipro rentals here! 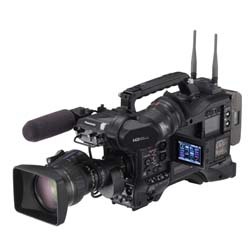 We also have new HD P2 Card cameras in our HD video camera rental inventory. Panasonic HPX370 HD video cameras for rent and the brand new Panasonic HPX3100 HD cameras for rent. The AJ-HPX 3100 HD Camera is Panasonic's new 2/3" P2 HD camera. Featuring three 2/3" high density 2.2 million pixel CCDs, the HPX3100 acquires full-raster 1920 x 1080 resolution imaging with 4:2:2 10-bit sampling using the advanced AVC-Intra codec. Using two P2 slots, this High Definition camera rental records in multiple worldwide formats, in HD in AVC-Intra and in DVCPRO HD at 1080 in 24p, 25p, 30p, 50i and 60i, and in SD (480i/586i) in DVCPRO50, DVCPRO and DV. AVC-Intra, is a professional intra-frame video codec with bit rates of 50 and 100Mbps, utilizing the High-10 and High-422 profiles of H.264 respectively.